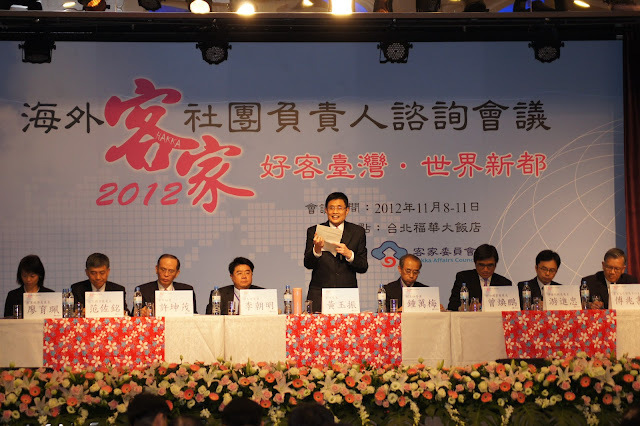 Our Association was invited by the Hakka Affairs Council of the Taiwan Government to attend The Overseas Hakka Community Leaders Advisory meeting in Taipei, which was held from 8th to 11th November 2012. Our Committee member Xiao Ye and wife represented our Association to attend the meeting which was opened by the President of the Republic of China (Taiwan) Mr Ma Yin Jiu, who is also a Hakka. Honorary Chairman of the ruling Nationalist Party and the Taiwan United Hakka Associations President Mr Ng Bak Hiung with Xiao Ye and his Mrs. The Advisory Meeting of the Overseas Hakka Community Leaders in progress.